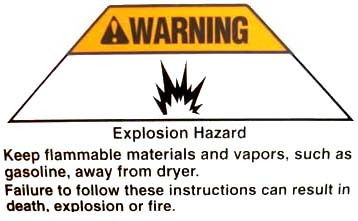 We use laundry equipment everyday with out a lot of thought to the potential hazards they may pose. According the Consumer Product Safety Commission washers and dryers are responsible for more then $230,000,000 worth of property damage a year in the US alone. Most of the common problems at the root of these statistics are easy to address. We found this dryer power cord on an inspection, notice it does not have a proper strain relief connector. As with all power cords be careful when you use the plugs, but ESPECIALLY with large 240 volt connections. The plugs are large and require a bit of effort to insert, making it necessary to wrap your hand around the plug and it is easy to accidentally touch the conductors when inserting or removing them. This same advice applies to all large sockets like electric ranges, RV plugs, large tools etc. Metal braided hoses are much more resistant to bursting. Plugged vents and hoses are a fire hazard. This hot water heater has exhaust rollout. 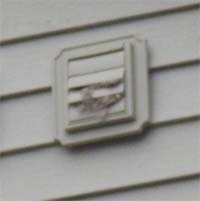 Improper flue design or inadequate air supply can cause combustion gasses to vent into the home. If your heater has these stains please have it checked out. 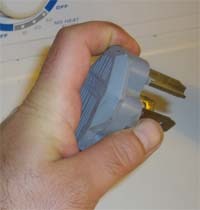 Dryers use a lot of power, and usually do not come with their power cords installed when you buy them. 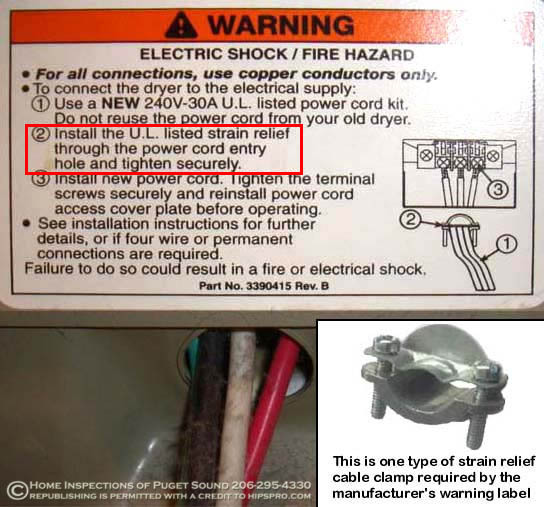 When hooking up a power cord, follow the manufacturers instructions, and be sure to have the proper strain relief fitting. Since dryers vibrate and can have sharp edges to the sheet metal enclosures, cords can short out, causing a potential fire or electrocution hazard. These hoses are under pressure all the time and can burst causing extensive water damage to the home. Since washers will jiggle when they operate the hoses can rub against the wall behind them. 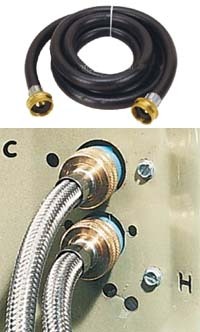 We always recommend the metal braided hoses for washers since they are much more burst resistant and less likely to be damaged by the movement of the appliance. Leave at least 4 inches of space behind the washer to prevent hoses from kinking or chafing and inspect them regularly. If you see any bulges, rust or any other damage, replace them right away. It is recommended that you check and clean the dryer venting regularly. Use flexible metal pipe, not the foil or vinyl accordion type hoses, they are more likely to catch lint and have an increased risk of fire. Read an article on cleaning dryer vents here. Smoke detectors are important in laundry areas, since fires associated with dryers cause more then $80 million of damage a year. Be sure that dryers are properly vented outside and not leaking inside the home, attic or crawlspace as this moisture is a conducive condition for structural pests. If there is significant lint buildup inside, your dryer vent is likely leaking. When dryers run they exhaust a lot of air outside the home. This can produce a negative air pressure condition leading to a possible back-drafting of combustion gasses from furnaces, hot water heaters etc. This problem is especially true in modern energy efficient homes or confined spaces such as a closet. All homes with combustion appliances must have carbon monoxide detectors! Read more about back-drafting hazards here. Then properly installed, GFCIs prevent two thirds of all serious electric shocks a year. 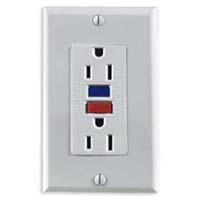 All outlets with in 6 feet of water, (laundry, kitchens and bathrooms) in garages or outside should have GFCIs. They are cheap and easy to install and might save your life. Read how install them here. 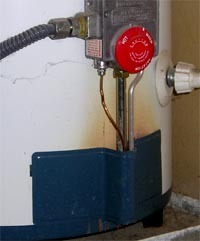 Both washers and dryers have electric motors and other components that can produce sparks capable of igniting flammable vapors or gasses. Laundry equipment are sometimes in garages where there may be gasoline, paint, solvents, propane etc. Always store these chemicals in their original, properly labeled air tight containers. If there is a spill, DO NOT use any electrical appliance or garage door openers until it is cleaned up and all vapors have dissipated. Again, very good information to have. Thank you for these posts. Post © 2019 JJ and Suzanne Greive - Seattle Area ASHI Inspections (Home Inspections of Puget Sound). Design © 2019 ActiveRain, Inc. All rights reserved, Inc.